The ancient Egyptian city of Akhetaton, also called Tell el-Amarna or Amarna, was the capital city built by Pharaoh Akhnaton and abandoned shortly after his death (ca. 1336 BCE). It was here that he pursued his vision of a society dedicated to the cult of his one god – the Aton. A series of tablets carved in the face of the cliffs behind Amarna record the foundation of Akhnaton’s new capital city in his own words. He wrote that he was led there by his god – the Aton. He wanted a pristine location that had not been dedicated to other deities. Amarna is 194 miles (312 kilometers) south of Cairo and 250 miles (402 kilometers) north of Luxor. It is located on the east bank of the Nile. The name Amarna comes from the Beni Amran tribe that lived in the region. Tell means “hill.” The ancient Egyptian name for the city was Akhetaton, which means “the Horizon of the Aton.” Today the city is, for the most part, covered with sand or badly eroded. None of the stonework of the temples or palaces survives, for they were removed after the Amarna Period. 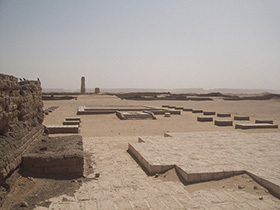 Construction of the city started in year 5 of Akhnaton’s reign and was probably completed in year 9, although it became the capital city two years earlier. To speed up construction, most of the buildings were constructed out of mud-brick and white-washed. With an emphasis on worship taking place toward the light in the sky (towards Akhnaton’s god, whose symbol was the sun), solar worship spaces typically dispensed with the roof. Therefore the main temples no longer needed massive blocks to bear heavy roofing stones. Egyptian architects switched to small blocks, called talatats, that characterize constructions of this period. A workman could easily carry one talatat under each arm. A central structure of Amarna was the Great Aton Temple. This entire temple was open to the sky. Reliefs, statues, and mosaics decorated all the temples and palaces. Many scenes in the Amarna tombs depicted the Royal Family, which consisted of Akhnaton, Nefertiti, and up to six daughters. Not only was Akhetaton the center for worship of the Aton and the dwelling place of the king, this new city that was created in just four years became the home of an estimated 30,000 people.